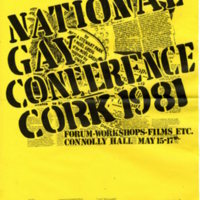 The first ever Irish National Gay Conference was held in Cork on 15-17 May 1981. The Cork Gay Collective, the Cork IGRM, the UCC GaySoc, as well as a number of individuals, came together to organise the conference, brining together lesbian and gay activists and organisations from throughout Ireland, with a number of British and American activists also attending. The conference provided an opportunity to review the progress of the LGBT movement to date in Ireland and to develop recommendations for future actions.